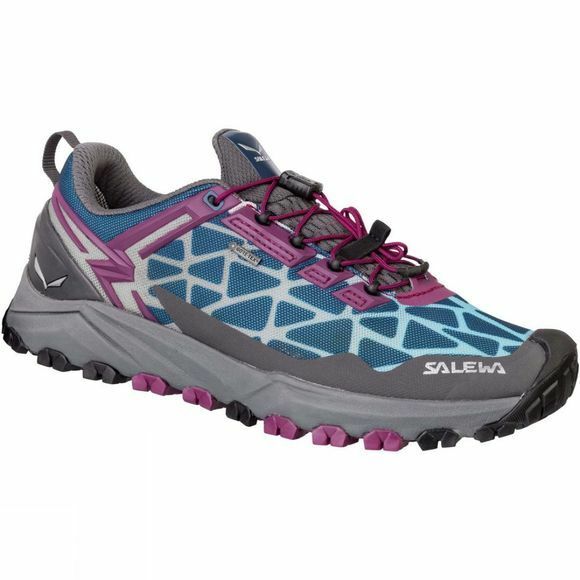 The Womens Multi Track GTX Shoe is a low–cut, lightweight breathable mountain training shoe with a Michelin outsole that covers a wide range of activities: speed hiking, mountain training or other high–octane mountain sports. Its hybrid design meets the demands of three different sports: hiking, running and mountain biking. Perfectly at home on rough and uneven terrain such as rocky trails, mud or grass, the Multi Track offers the stability of a hiking shoe, the cushioning of a running shoe, and MTB flat pedal–compatibility – thanks to the specially designed tread pattern under the forefoot. Its hardwearing and sure–grip Multi Track outsole was developed in partnership with Michelin.The Multi Track combines a weight–saving, minimalist upper with a cushioning midsole with TPU injected inserts. It benefits from Salewa’s 3F Total System which offers anatomical support, flexibility and a secure, blister–free fit. Further features include: quick lacing for fast adjustment and no chain snagging plus an OrthoLite footbed that inhibits the growth of odour–causing bacteria. The Multi Track is also the official shoe of the Red Bull X–Alps 2017 adventure race.